Fouquieria splendens Engelm. in Wisliz. Together with Ferocactus acanthodes near Borrego Springs, California, USA. Origin and Habitat: The range of Fouquieria splendens slightly exceeds the limit of the Sonoran Desert throughout southern California and south-western Arizona, Texas and Mexico (Zacatecas and Hidalgo). Small colonies or single plants occur in many localities on the mountains which overlook the northerm rim of the Sonoran Desert. Habitat: Dry, rocky hills, on slopes, plains and washes. It occours to a large extent, if not exclusively, in soils which are abundant of limestone, well aerated and possibly also relatively warm. In the drier an lower part of its areal the soil is more sandy and loose. Ecology: Sometime it makes thin pygmy forest in the arid landscape. It grows with a large assortment of cacti and other succulents, including Mojave yucca (Yucca schidigera), beavertail cactus (Opuntia basilaris) Barrel Cactus (Ferocactus cylindraceus) Chollas (Opuntia spp.) and Desert Agave (Agave deserti). Hummingbird and carpenter bees (Xylocarpa californica) are the main pollinators. Fouquieria splendens f. micrantha Loes. 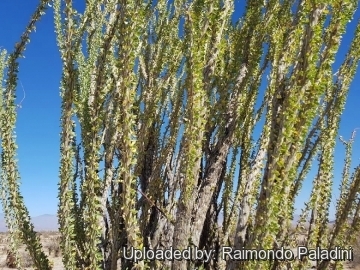 Description: Fouquieria splendens is an odd, slender, cactuslike, spiny shrub or small tree 2,5 to 6(-10) m high with little branched or unbranched stems and differentiated short and long shoots. 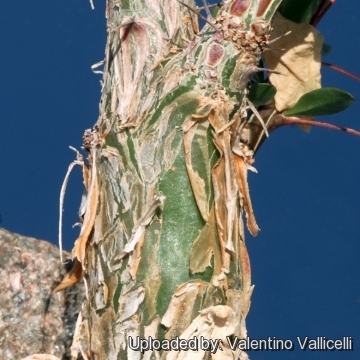 It branches profusely from the base in a typical candelabra shape and sheds its leaves and flowers during drought periods, but chlorophyll in the bark allows the photosynthesis also without leaves. It is the most widely distributed species of the genus. Trunk: Stocky, swollen, caudiciform, almost invisible, with rough and fissured bark. Stems: Multiple, usually 6 to 30 (occasionally up to 100), upright or arching, thorny green in clusters from a common root-crown; Individual stems are simple (pole-like) and only infrequently divide further, and specimens in cultivation may not exhibit any secondary branches. Bark whitish to grey-green with dark furrows. Individual stems may reach a diameter of 5-6 cm at the base. 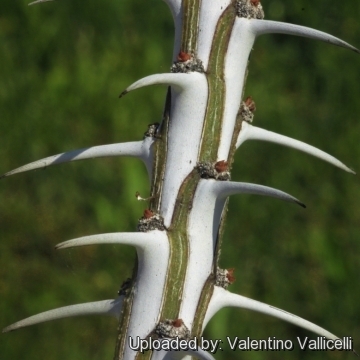 Stems are moderately succulent, intermediate between desert shrubs and true succulents. The stems epidermis contains chlorophyll that contribute to produce the photosynthate needed for the rapid development of ephemeral leaves and roots after rains. Roots: Largely superficial harbouring endomycorrhizal fungi. Leaves: It has two types of waxy and more or less succulent leaves. The first type of leaves is long spoon-shaped, up to 5 cm long, is produced only during the wet season. 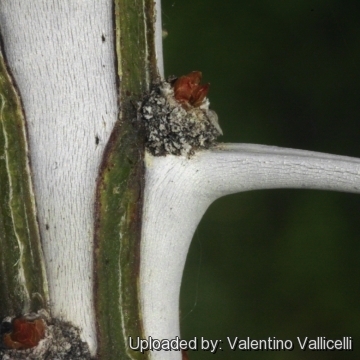 The petiole of spoon-shaped leaves persist after the blades drop, becoming hard, conical spines. 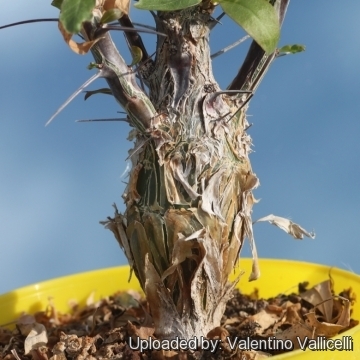 The second type of leaves are obovate to elliptic, appear shortly after each brief warm-season rainfall in fascicles on short shoots, often fully formed within 48 hours and drop in a drought, leaving numerous scars. Leaves are shed whenever the conditions become arid. 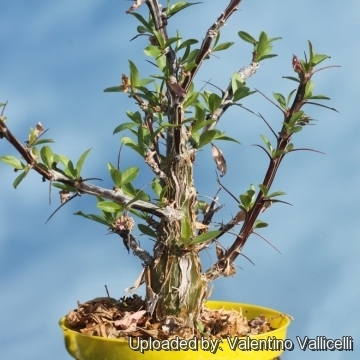 Depending on the rains a plant may gain and lose its leaves six or more times a year. Fouquieria splendens is leafless most of the year and generally remain leafless during coldest part of winter. 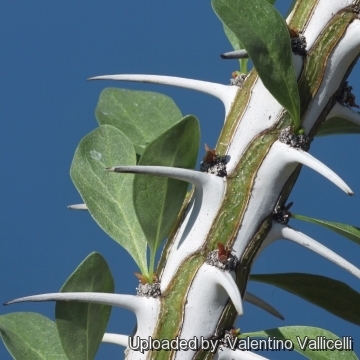 Spines: It has blunt petiolar spines 1–4 cm long (derived from original leaves of long shoots) The leaf stalks harden into spines, and new leaves sprout in cluster from the base of the spine. Inflorescence: The inflorescence is a dense panicle clustered indeterminately at the tips of each mature stem, generally (5-)10–20(-25) cm long, widely to narrowly conic. Flowers: Petals are fused together into a cylindrical tube 11-22 mm long with five spreading or reflexed lobes and 10 or 20 stamens extending beyond the corolla. They are orange-red to red ( rarely pinkish, creamy white or white in var. albiflora lodé 1992), corolla 1,8–2,5 cm in diameter. Individual flowers are mildly zygomorphic and self-compatible. The stamens are attached at the base of the corolla and there is just one pistil with a superior ovary. Extrafloral nectaries occur on the flower buds. Fruit: 3-valved capsules 1-2 cm long. Blooming season: Flowers appear especially after rainfall in spring, summer, and occasionally autumn. Spring blossoming lasts 50-60 days. Fouquieria splendens Engelm. in Wisliz. : Tube 7-22 mm orange-red to red. Fouquieria splendens var. albiflora Henrickson: (subs. campanulata) Tube 5-9 mm creamy white. Fouquieria splendens f. albiflora Lodé: Tube 7-22 mm white. Fouquieria splendens subs. breviflora Henrickson: Tube 6-10 mm orange-red to red. Fouquieria splendens subs. campanulata (Nash) Henrickson: Tube 5-9 mm pink to deep purple or creamy white (var. albiflora). Distribution: Sierra Madre Occidental to Rio Nazas Basin, Durango, Mexico. Fouquieria splendens f. micrantha Loes. : Tube 7-12(-22) mm orange-red to red. 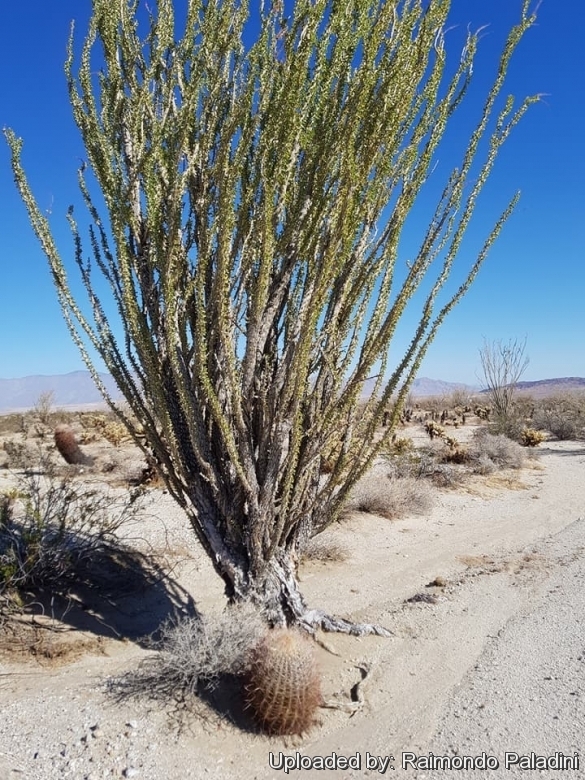 5) Sia Marhardt, Emil Morhardt "California desert flowers: an introduction to families, genera, and species"
1) Individual ocotillo stems are used as poles as a fencing material in their native region, and often take root to form a living fence. 2) Owing to light weight and an interesting pattern, these have been used for canes or walking sticks. 3) Flowers are collected, dried, and used for herbal tea. 4) Fresh flowers are used in salads and have a tangy flavor. They can also be dipped in batter and fried. Propagation: Seeds or cuttings. Seedling grow fast but need a deep pot to accommodate the the stout taproot. 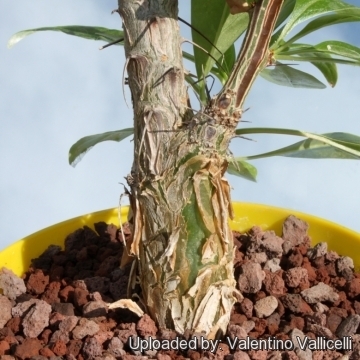 Transplantation: Is is easily transplanted and widely used in gardens.